The term human rights defender (HRD) refers to anyone who promotes or defends any of a vast array of rights which may include civil and political rights (such as freedom of speech or justice for survivors of abuse); transparency and anti-corruption or greater political participation; environmental rights, social justice, and cultural rights; rights related to sexual orientation and gender identity, or advocating for the recognition of new human rights. Regardless of their given profession or the human rights they promote, recognition of the work of human rights defenders under international law, as well as under the laws of numerous States, affords HRDs an additional layer of protection to carry out the work that they do. Unfortunately, human rights defenders continue to suffer attacks at the hands of both State and non-State actors seeking to hinder their work. This impacts upon defenders' physical and psychological integrity, and often further affects their friends and families. In order to stop or deter human rights defenders' work, adversaries often close down the space for free and peaceful association, communication, expression, organisation and the support of survivors of human rights violations. For example, women human rights defenders are frequently targeted for (often sexualised forms of) violence, due to their work challenging normalised patriarchal discourses, laws and traditions. Those working on the rights of Lesbian, Gay, Bisexual, Transgender and Intersex (LGBTI) persons and other sexual orientation and gender-identity issues are often similarly targeted and marginalised by existing power structures. Environmental rights defenders, as well as anti-corruption defenders, find themselves targeted for personal, economic and societal attacks by private companies seeking to protect their interests, as well as State and non-State agents. In addition to the above, recent times have seen the development of increasingly complex electronic surveillance mechanisms which encroach upon our personal lives and into our daily activities, communications and ways of working. This factor poses a significantly greater threat for human rights defenders, who may find themselves exposed, their sources compromised or their work jeopardised as a result of their online activities. In the vacuum created by a lack of adequate protection by the State, security and protection become key issues for human rights defenders: at home, at work and while carrying out activities to promote or defend human rights. The purpose of this guide is to help HRDs take an organised approach, building strategies to maintain their well-being and creating space for activism and resistance, whether working alone, in small groups, collectives or organisations. This guide is the first to explicitly adopt a 'holistic' approach to security and protection strategies for human rights defenders. In short, this means that rather than looking separately at the importance of our digital security, psycho-social well-being and organisational security processes, it attempts to integrate them and highlight their interrelatedness. Lack of adequate awareness of the emotional and psycho-social aspects of security often blinds us to potential threats, such as the effects of long-term stress on our health. Furthermore, fostering mental and physical well-being benefits our ability to understand our security situation and take critical decisions. With increasing digital surveillance of activists, lack of adequate understanding of the digital technologies we use in the course of our work can also greatly limit our ability to accurately perceive the threats around us. Achieving this understanding and taking proactive decisions to protect our data from unwanted access or surveillance not only means a more comprehensive approach to our overall security, but also provides us with relative certainty regarding the source of threats which can be highly secretive and difficult to perceive. Adopting security measures in an ad-hoc manner or based on 'tradition' or hear-say, without carrying out an analysis of our context and the threats we face, often leads to us taking decisions which give us a false sense of security. Therefore, it's vital that we regularly map out the socio-political context in which we are acting, identifying as accurately as possible the threats that we face and updating the strategies, tools and tactics we can use to defend our space and continue working in an empowered manner. Following on from important work carried out by others in establishing the 'Integrated Security' approach, the holistic approach in this manual is founded on the understanding that 'security' is a deeply personal, subjective and gendered concept. Indeed, 'security' takes on a special meaning when we consistently find ourselves in danger as a result of standing up for our rights and the rights of those around us. Therefore, our approach must take into account the subjective and personal nature of each journey in defence of human rights. Any attempt at a 'rational' understanding of our security situation must consider, accept and embrace our own inherent irrationality. Our approach to security and protection must take into account the effects not only of physical violence, but also structural, economic, gender-based and institutional violence, harassment and marginalisation. This may be perpetrated by the State, but also by private corporations, interest groups, non-State armed groups, or even our own communities and those close to us This can deeply affect our psychological well-being, our physical health, and our relationships with friends, family and colleagues. Awareness of, and action regarding these threats is vital in order for our activism and resistance to be sustainable, and in order to facilitate our ability to identify and implement strategies for our security and protection. As such, we understand and assert self-care, all too often considered 'selfish' among activists, to be a subversive and political act of self-preservation, and one which is fundamental to effective security strategy and culture. Our security strategies also have to be regularly updated. As the context around us changes, so do the tasks and challenges in integrating security into our work. This is particularly true in an era in which we have become increasingly dependent on digital tools and platforms for our activism: computers, mobile phones, social media, digital cameras and further technological solutions have become indispensable to our work, but they also work against us as tools of surveillance, identification and harassment by States, armed groups, companies, communities and families. As such, comprehensive security must not only include our bodies, emotions and mental states, but also the electronic information contained in devices in our hands, pockets, bags, homes, offices, streets and vehicles. We can not fully understand our security or well-being without taking due account of the role of the digital dimension in our personal lives and activism. This manual, therefore, explicitly integrates the need for an understanding of our technical environment and its relation to our work and our security. The content of this website is divided into four Sections: Prepare, Explore, Strategise and Act. These four steps are conceived as an evolving cyclical process, which should be regularly revisited as part of your existing strategic planning. In Prepare, we begin by recognising that each of us already has and takes security measures: our strategies for health and well-being, our personal beliefs and sources of resilience and our instinctive responses to threat and danger. We encourage you to consider these and their effect on group dynamics which must be recognised in order to engage with security strategies in a more productive way. In Explore, we follow a series of steps in order to analyse our socio-political context and come to some conclusions about the concrete threats which may arise from our work and those who oppose it. In Strategise, we begin with the threats we have identified and consider how to create security strategies to deal with them, as well as develop concrete plans and agreements in order to maintain our well-being in action. Engaging in these three steps prepares us for the fourth step, Act: learning new tools and tactics for our security in action. Act comprises a series of short, scenario-focused guides which focus on concrete tools and tactics – from the technological to the psychological and beyond – for security in particularly high-risk activities. This manual is designed to guide a process of establishing or improving security strategies for individuals, collectives or organisations. We use the term human rights defender to be as inclusive as possible and hope that the manual will be of use to people working in a variety of different capacities, from grassroots defenders and community organisers to lawyers, journalists and activists. Although it is written in a linear narrative format with a suggested structure (particularly for groups who are new to implementing security measures as part of their strategy), you should feel free to focus on any part of the content which you feel is useful. Each of the four Sections is divided into a number of shorter Chapters, the majority of which are accompanied by one or more reflective exercises which should help you to get to know the relevant content in your own context. These exercises can often be used for individual reflection, but were written in such a way that they could also be carried out in larger groups. Tips are included to help you facilitate the exercises in a group setting. For effective implementation within a collective or organisation you will need to regularly and consistently set aside time and space to work on you security and well-being as a group in the context of your activism. The manual was written by an editorial collective of security and strategy trainers, in collaboration with a large group of experts and human rights defenders; as a result, the structure reflects that which would be utilised in a training scenario. The exercises in each Section provide space for reflection as individuals or groups, in order to facilitate a self-directed path towards holistic security practice without the necessity for external training and expertise. We invite you use this manual to guide and inform your holistic security practice at a pace suitable to you and/or your organisation. The intention and motivation behind creating and integrating a defined holistic security approach, in the sense of 'well-being in action', is to treat this as an iterative, evolutionary process wherein this manual is to be viewed as a starting point only. As such, the authors prioritised completion and thoroughness over making a shorter pocket guide; it is our hope that this longer text can later be contextualised to fit different audiences with differing priorities and preferred means of learning. Therefore, the authors whole-heartedly encourage feedback, contextualisation, copying, further development and wider distribution of such versions of this initial framework. The manual builds on concepts previously established in a number of existing resources including Protection International's 'New Protection Manual for Human Rights Defenders', Front Line Defenders' 'Workbook on Security for Human Rights Defenders', Front Line Defenders and Tactical Technology Collective's 'Security in a Box' and Kvinna till Kvinna's 'Integrated Security Manual'. As such, we express our gratitude to the authors of the above guides, the community of human rights defenders and those working for their protection and empowerment. We hope that this manual contributes positively to the field. Finally, we would be deeply grateful for any feedback or suggestions regarding how to improve the manual and its methodology, particularly those from human rights defenders and trainers attempting to implement it in the course of their work. Please, do not hesitate to contact us at ttc[at]tacticaltech.org with comments and suggestions which we can take into account in future editions. 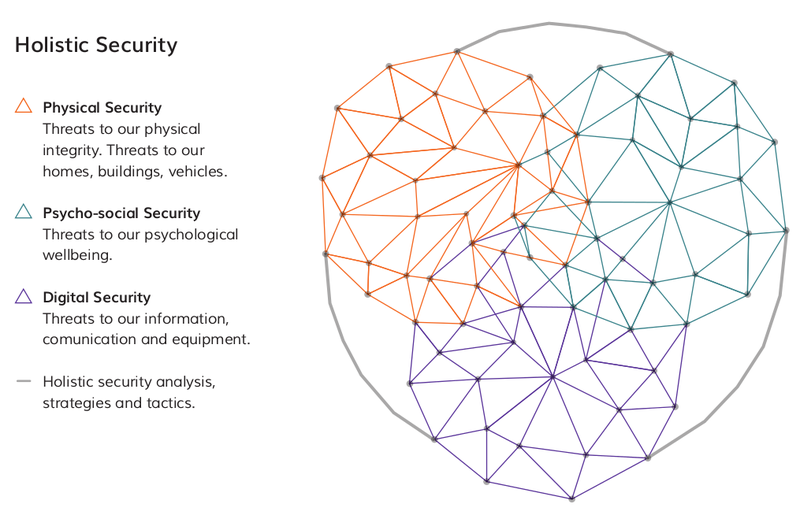 Read more about how we first came to the idea of holistic security here. In Act, we identify some skills, best practices and resources which are often useful for increasing security during particular activities which are common among human rights defenders. The first guide looks at exercising the Right to Freedom of Assembly with regard to protests and demonstrations.